Some TEFL/TESOL course providers use certain tactics to deceive and manipulate the consumer to buy. The TESOL/TEFL business is largely unregulated, which means that anyone can come in and set up shop and start selling their piece of paper. Many prey on uninformed and naive newcomers, like possibly yourself, to make money. For them it's a one time deal, cha-ching! As you won't be coming back for more. Certificates may be required in some places/schools, however, they are not required in many and for me it wasn't worth it. Your experience will probably be different, but before you proceed, read. In this article I'll show you some examples (including screenshots/pics) of lies and deceit being told by TEFL/TESOL providers. Some of these relate to what the requirements are for teaching English in Asia. This photo was taken from an old brochure that I found lying around from the company where I took my course. It states that a TESOL certificate is required to "legally" teach in UAE, Saudi Arabia, Dubai, Taiwan and Korea. I can't speak for all of those places, but I have taught in China, Taiwan and Korea for 6+ years and I can tell you that it is not a "legal" requirement. "Global TESOL College" later found this article and ironically said, "You should be prudent in your research and not misguide people in terms of international requirements." And, "This is what gets you the work visa that is issued by the government." That is not true at least in Eastern Asia where the basic requirements to teach English are to be a native speaker and to hold a bachelors degree in any subject. Those requirements are for the work visa. Without those you can't legally teach English most of the time. And then they said, "Hence, it being listed as a requirement on every single job posting." I suppose it depends on which site you look at. If you look at advertising based sites for TEFL/TESOL courses like TEFL (dot) com - like they pointed out, then you might see that, but you'll find something different if you look at other ESL sites for teachers. And finally, "...please remove "GTC" from your article or we will take further action." Here's another one by i-to-i. They say an online TEFL course is required to teach in Taiwan. That's not true. 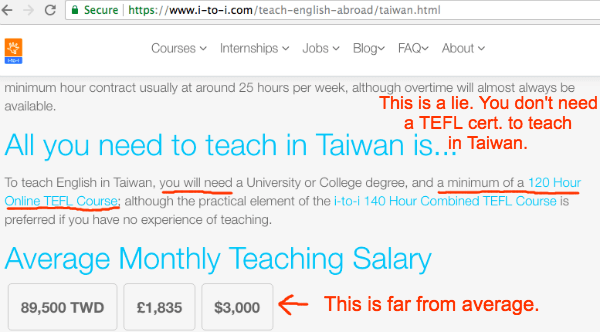 They also say the "average" salary to teach in Taiwan is NT$89,500 which is really high and far from average. Buxiban teachers will make about NT$48-60,000. And "licensed teachers" in public schools will make closer to NT$60-70,000. Sometimes I hang out on Yahoo Answers and answer peoples questions about teaching abroad. And I can tell you that there are a lot of lies being told over there by TEFL providers on a regular basis. 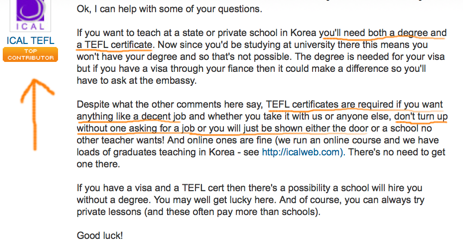 This one again relates to what the requirements are for teaching in Korea. Since I have taught there in both public and private schools I can assure you that a TEFL certificate is not a requirement in a "state or private school". Here's one I found on their site. It states that an "Oxford Seminars" certificate is required to teach in China. Some schools may prefer teachers with TEFL certification, but to legally teach English in China you need a degree and to be a native speaker to get a Z visa. 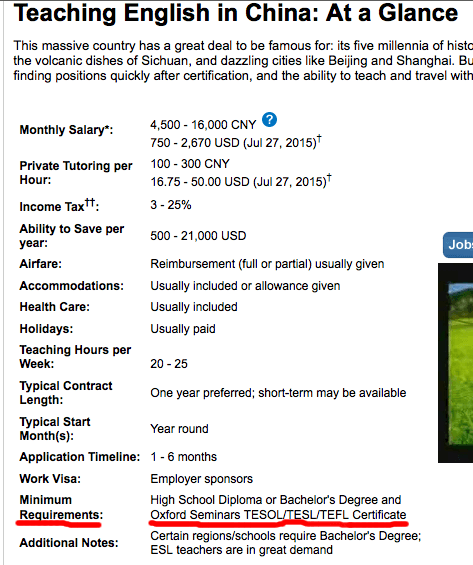 Learn more about the requirements to teach English in China. They're not so called "fly by night" companies, yet they're still selling lies. Geez, I was kind of surprised to have found this one. Isn't CELTA supposed to be the best in terms of TEFL courses? I mean CELTA has such a good reputation??? Or is that reputation partly built on marketing hype from CELTA course providers? As you will soon see it's still not free from the lies and hype some TEFL providers tell. This provider said the following on their site that I found linked to on Wikipedia. "The CELTA is a foot in the door at the world’s most reputable academies, known for their high-pay, security and benefits. Take the Disney English School in China, for example, which is now offering several $2,500USD-a-month positions across the country, with airfares, rent, dental and health care all paid for. And, they’ll only take CELTA-qualified students." What are the basic requirements to work for Disney English? As you can see for yourself it doesn't say anything about a CELTA certificate. I would also add that Disney English is not an extraordinary school. No offense to Disney, but it is not an "elite" school. It's a chain school with more than 40 branches across China. Perhaps the moral of this story is don't believe everything you read or are told by TEFL/TESOL providers. Some companies lie and misinform naive newcomers. Do your research and don't take advertisements at face value. Learn more about TEFL course scams.